Ignorance confession #1: All I really knew about Philadelphia when we arrived was that a Tom Hanks movie and a Bruce Springsteen song were named after the place. My movie/TV buff friends insisted I eat a Philly cheese steak (The President apparently eats one in West Wing) and pose in a boxing stance on the steps like in Rocky. 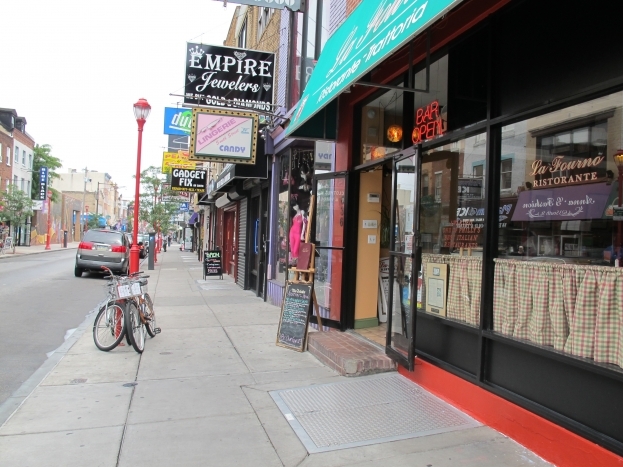 With that in mind, we set about enthusiastically exploring what turned out to be a funky and fascinating city. 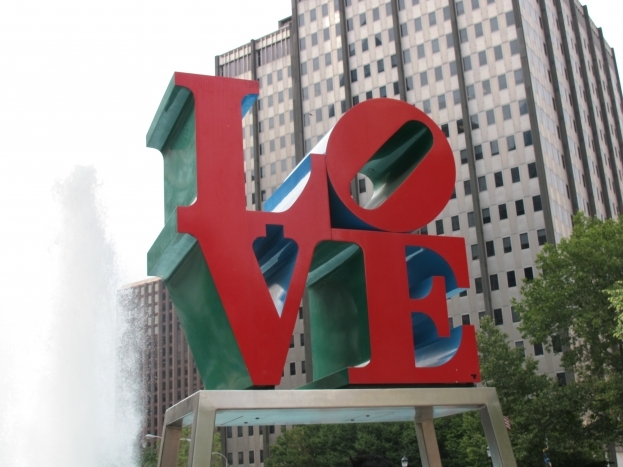 It’s also the city of brotherly love – celebrated in the sculpture pictured above. We touched down on July third and found ourselves in the midst of a historic wonderland, throbbing with American toursits. 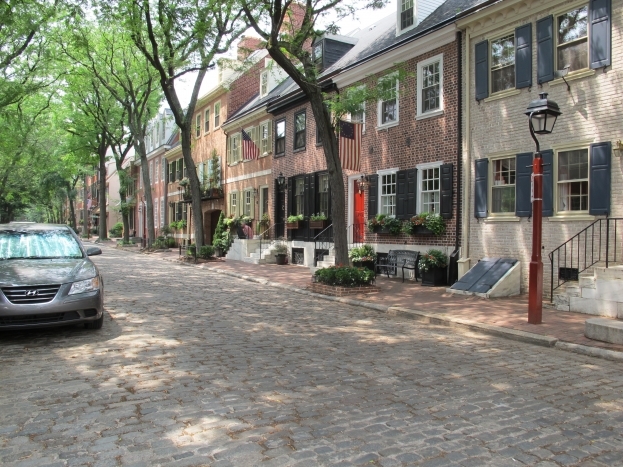 It turns out Philadelphia is the place to celebrate Fourth of July, and we were only too happy to oblige. We spent our first day trekking the streets and getting a grip on the history of the place. We discovered the US constitution was signed in Philadelphia, and it was actually the nation’s capital for the first 10 years – from 1790-1800 – before it moved to Washington DC. 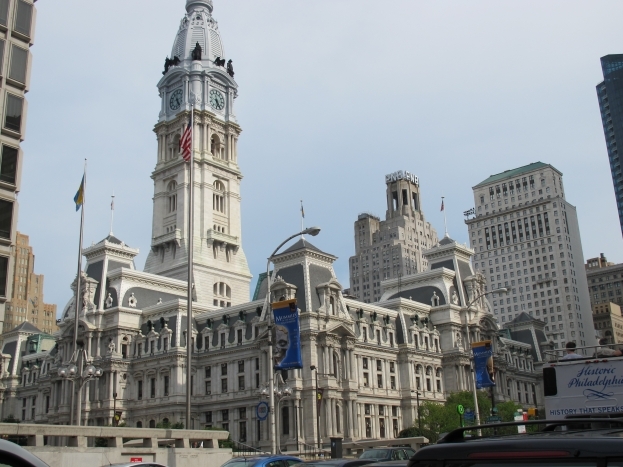 We checked out Benjamin Franklin’s printing press, City Hall – America’s largest city hall (pictured below) – and learnt plenty of disturbing facts about the history of slavery in the area, and how they’re determined not to repeat the mistakes of their forefathers. 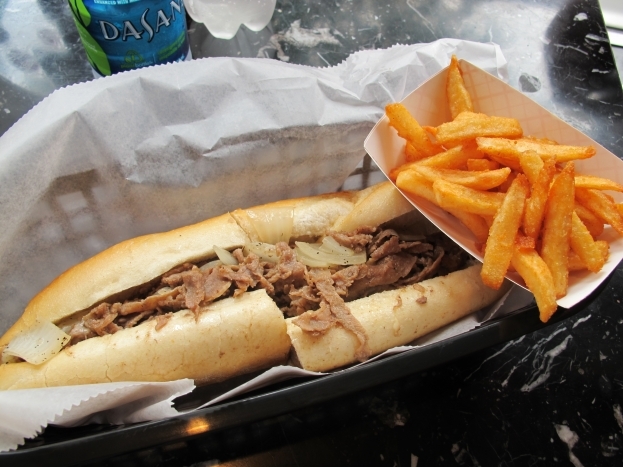 We also tracked down a famous Philly Cheese Steak sandwich – it’s a soft white roll, with chopped steak, chunky cooked onion and stringy cheese. It was tasty, but sickening, so with that box ticked, we went and found a rock ‘n’ roll pub to get oursleves aquainted with the local beer and cask wine, while trying to keep our eyelids from rolling into a jetlag-induced stupor. We gave in at 8pm and stumbled back to the hostel for a good old sleep that dorm room revellers couldn’t even interupt.